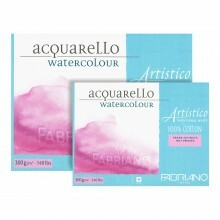 Arches Aquarelle watercolour paper is acid-free and chlorine free. It is made of 100% cotton fibres which provide strength and stability. The paper is tub-sized in natural gelatine and air-dried, it can take scrubbing, scratching and erasing while keeping the original intensity of the watercolour. Arches Aquarelle uses no optical brighteners so it's natural white colour will not yellow with age and archival value is ensured. 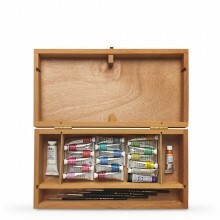 Suitable for watercolour, gouache, pen and ink, acrylics and calligraphy. This block of 20 white sheets of Arches Aquarelle watercolour paper measures 12 x 9in and is glued on four edges. The weight of the paper is 300gsm. Please note, this product has a hot pressed surface. 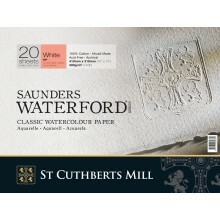 The surface of the paper is extremely smooth, which is ideal for detailed watercolour painting. HP watercolour paper has such a daunting reputation as being the most difficult to handle of the 3 types of watercolour paper. When you are used to the more obliging CP and Rough papers, HP can be a real struggle to come to terms with. Everyone will tell you that its good for 'dry' botanical illustrations, not so much for wet in wet washes. I bought this paper because I really wanted to see what it can do. My first wet in wet landscape was a failure, and I could see that the washes were drying too fast, and leaving hard edges. The water/paint would pool instead of washing down even though I had my paper at an angle. I then started to play with painting individual roses rather than a large landscape, some wet on dry, others wet on wet. Here I was more successful: the colours looked vibrant and the shapes were convincing. My third attempt was a winter scene landscape. I wouldnt call it a huge success, but it taught me that, with HP papers, you have to work in small areas at a time, instead of large washes over the entire paper. Almost as soon as a wash goes on, it starts to dry, so its best to tackle the sky (bkgd), then the land (foreground), then the details. My fourth attempt was a floral composition which I was able to complete in about 2 hours. This was definitely a success, and shows how LOOSE you CAN paint on HP papers, contrary to popular belief. I achieved the loose flowing look by working on small areas at a time, and not moving the paint about too much, instead letting it do its own thing. This HP paper also allows you to scrub out areas even after the paint has dried. The block format means you can paint really wet without worrying about the paper buckling. Because of its smooth surface, any painting you make on it seems to glow with light.